So I've been eyeing those wire hangers that say in my case Mrs. Branson, but I have not been ecstatic about the cost! After getting one for me, my maids, and my mom I will be out about $150. While I consider myself a crafty person I do not consider myself even with pliers strong enough to make my own. Lucky for me I found this on The Knotty Bride! Such a great idea to save money and have cute hangers. 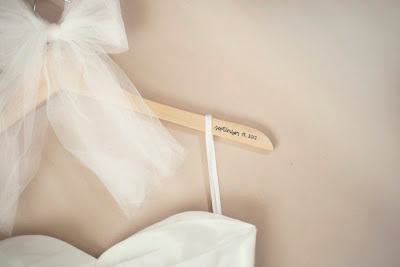 All that's needed is a sharpie, roll of tulle ribbon (color is up to you), and a pack of wooden hangers. I think I will do names in calligraphy instead of the date.